7th Annual Conference of the Lacea Trade, Integration and Growth Network (TIGN) joint with 8th Sao Paulo School of Economics Conference Series, on May 24th-25th, 2016. This conference is sponsored by LACEA, the Inter- American Development Bank (IDB) the CAF-Development Bank of Latin America (CAF), and Sao Paulo School of Economics-FGV, and is organized by Sao Paulo School of Economics-FGV. The local organizer is Emanuel Ornelas. The TIGN conference is a unique event that brings together top researchers and policymakers to discuss recent theoretical and empirical advances in trade and integration and growth broadly defined. The goal of these meetings is to use the findings of research in order to gain a better understanding of the problems, opportunities and policy challenges faced by Latin American and Caribbean countries in the process of integration and also to encourage further research on the subject. This year selection of contributed papers and discussants will be made by a Program Committee whose members are Javier Cravino (University of Michigan), Emanuel Ornelas (Sao Paulo School of Economics-FGV), Andrés Rodriguez-Clare (UC Berkeley), Pablo Sanguinetti (CAF), Peter Schott (Yale University), and Christian Volpe Martincus (IDB). Theoretical, empirical, and policy-oriented papers dealing with the economics and politics of trade and Regional Trade Agreements (RTAs) as well as those linking trade and RTA initiatives with growth and productivity are welcome. Sponsoring organizations offer hotel accommodations and a round-trip economy class (most direct) airfare. Researchers currently occupying policymaking positions are welcome to participate at the conference without presenting a paper. These participants will, however, have to procure funding from their own institutions to participate in the event. To register for the conference and submit a paper, please visit the conference website (http://www.iadb.org/en/topics/trade/call-for-papers/home,7302.html) and follow the instructions therein. Deadline for submissions is February 29th, 2016. Authors of selected papers and discussants will be notified by March 15th, 2016. 05/24/2016, 09:00 - 05/25/2016, 13:30 p.m. The results of the inscriptions will be sent by email on June 20 th, 2016. Active applicants of CMCD and from associated universities have tuition free. Sao Paulo, Brazil, August 3rd, 2015. 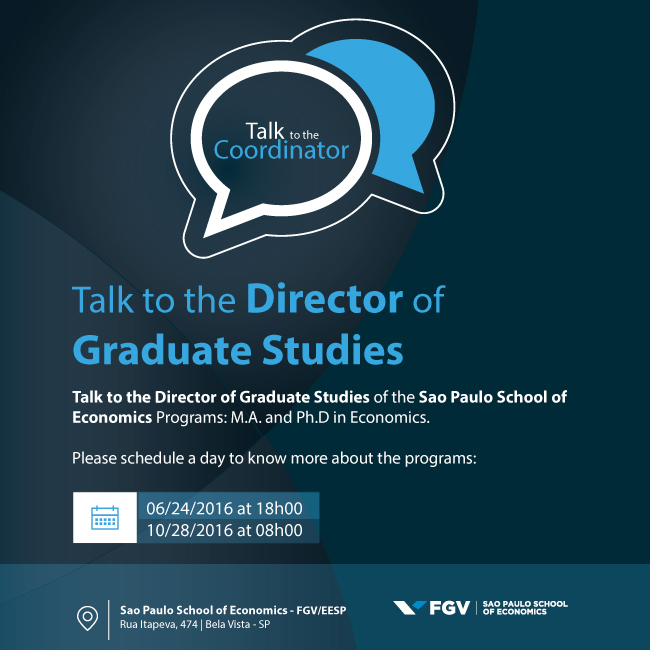 On August 3rd, 2015, a one-day workshop on Macroeconomics in Emerging Economies will be held at the Sao Paulo School of Economics - FGV. Confirmed participants: Pierre-Olivier Gourinchas (UC Berkeley), Andy Neumeyer (UTDT), Ugo Panizza (Graduate Institute, Geneve), Guillermo Vuletin (Brookings Institution) and Carlos Carvalho (PUC- Rio). 08/03/2015, 09:00 a.m - 07:00 p.m.